In 1896, František Kupka moved to Paris. In the years around 1910, he took part in the discussions of the Section d’Or group, which met at Jacques Villon’s, in Puteaux, alongside Francis Picabia and Juan Gris. He was interested then in the decomposition of forms and sought to introduce into his work a fourth dimension expressive of temporality. 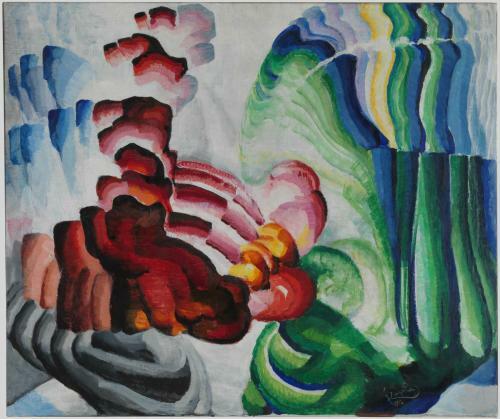 In painting this canvas, Kupka was inspired by chronophotography, the technique of analysing movement through a succession of still photographs developed in the late 19th century: Compliment renders in similar fashion the movement of two persons bowing in greeting.